Its Not Easy & It Is Scary! 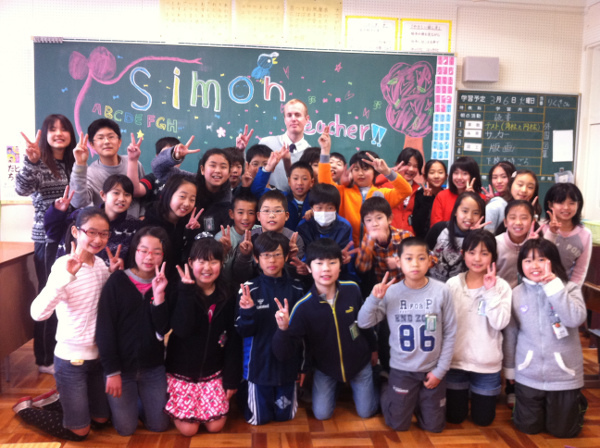 Simon Stannard, is a CAD Technician, who moved to teach English in Japan for six months in, his school was in Hamamatsu City in the Shizuoka Prefecture of Japan, located about half way between Tokyo and Osaka on the South West coast of Honshu island. I studied an online TEFL course through a company called i-to-i (www.i-to-i.com) that was recommended by a friend. The course was based on 100 hours online self study made up of different core modules and a two day practical workshop class that was held over a weekend at a hotel in London. When I signed up for my course I was asked what country I was hoping to teach in and when I told them Japan they put me in touch with a company called Interac (www.interacnetwork.com) who have offices in the UK and America. I had a telephone interview with their recruiter and then asked to come into their Oxford office for an interview. This was a day long event that was made up of a mini group seminar explaining in depth about how the company works, how they would provide 1 weeks training and orientation once arriving in Japan and what the job would entail. We had a couple of small grammar tests before doing a teaching demo lesson that was recorded and sent to the recruiters out in Japan who decided whether we were suitable or not. 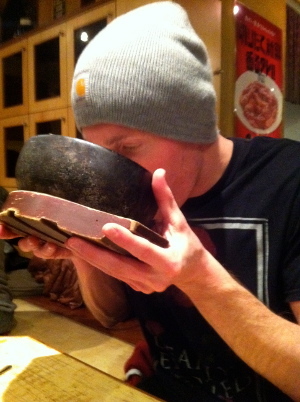 Although scary this was actually really fun. They provided a full brief on what was required before the day and the lesson was only 5 minutes long just to give an idea of how it would be to teach an EFL class. I was allocated two elementary and one junior high schools with twenty lessons per week, each lesson was around 45-50 minutes long and my students were aged between 10 and 15 years old. My typical working day started at 6am when I got up and made sure I had all my lesson plans required for that day plus any props or games I was going to use. I would normally teach 3 or 4 classes before lunch then 1 or 2 after, but most days it was limited to 4 or 5 classes maximum. At lunch time I would sit with a different class each day and eat with them, encouraging them to talk English with me. Sometimes I would play football with them afterwards too. After all my classes had finished I had to be in school until 4:10 so I would try and use this time to practise Japanese or prepare for other lessons later in the week. After school I would cycle home and chill out watch a film or go for a run. I would cook dinner at home a lot but also go out for dinner or hang out with my other teacher friends who were based within cycling distance from me. The biggest challenge was when I was dropped off at my new apartment. I was on my own and it suddenly dawned on me I was on the other side of the world, and I didnt speak or read Japanese. I was soon to be expected to teach up to 700 students per week in three different Japanese schools and besides the interview and the one weeks training and orientation I had never taught before. This sudden wave of panic and fear took me back for a moment but then I realised that being this far out of my comfort zone and doing something so alien to me was my whole point in being there and that a challenge and new experiences was exactly what I was looking for. I had many amazing experiences during my time teaching in Japan but overall I would say that teaching my 5th and 6th year Elementary students who were aged between 10 and 11 was the best. They would erupt in a sea of smiles and excitement every time I walked into their classroom. We would sing songs, do silly dances and play fun games to help them learn English. They were always so hyper, happy and just ecstatic about my lessons. On more than a few occasions they were uncontrollably laughing and teaching them was always fun and something I looked forward too. "Teaching them was always fun and something I looked forward too." You do need to be able to adapt to whatever is thrown at you. One weekend I didnt receive my schedule on the Friday and was unable to prepare for my 4 lessons on the Monday. I think an error was made and I didnt get the email. In a bit of a panic I used my initiative and decided to plan my lessons on the next part of the textbook, although when I arrived at my school on Monday I found out they actually wanted me to teach something else that day so I had to make it up as I went along. Somehow I pulled this off by improvising and using songs and games adapted from other lesson plans. Although it wasnt pleasant, and I hate being unprepared, it taught me how to adapt to this situation and make do: after that day I never really worried. 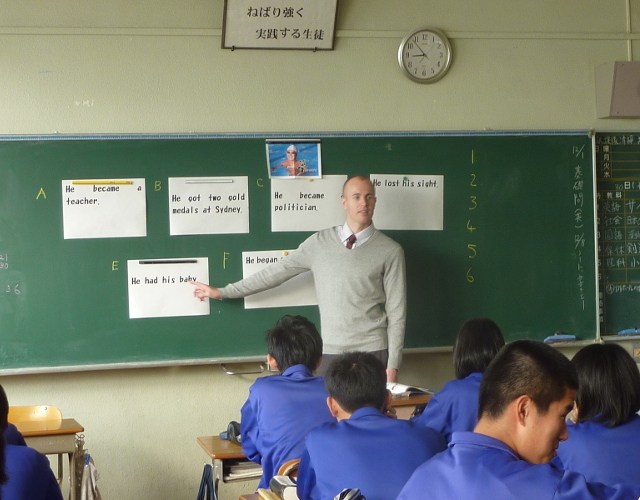 At times when I was teaching and doing silly stuff it would suddenly hit me that I was teaching English in Japan, which was a very surreal and rewarding experience. I was told that you might not remember all the students you taught but they will always remember you. I would recommend using Interac if you wanted to teach in Japan as they take care of everything for you which looking back was amazing. Stuff like setting up a bank account, renting an apartment, registering with the tax office and buying a mobile phone contract would have been impossible without the help of their friendly, caring team of translators/ coordinators (I.Cs) who were always on hand to help throughout my stay in Japan. If I needed to go to the doctors or just needed help with any matter they were always an email or phone call away. I would say that towards the end of your stay in the country you end up in that you should start to plan youre entrance back into the UK, looking and applying for jobs. I was a bit naïve at how long this takes but that may not be the case for everyone. Go for it! Its not easy and it is scary at first but when you see how how much fun the students are having because of something you are teaching them is an amazing feeling. Whats more you get to live and experience a foreign country from a working residents perspective. You will see and do so much more things than someone just passing through on holiday or on their travels. I would definitely recommend giving it a try, plus it will give you something a little bit different and interesting to talk about on your CV in the future. Tired and fed up of the mundanity of the 9-5 Simon decided to fly to the otherside of the world and get a job role that terrified yet also intrigued him in a country he'd never been to with a language he couldn't read, write or even speak.